Many people don't understand how their social security is taxed with regards to their retirement income plan. One of the benefits of working with Taatjes Financial Group is we understand and can help people look at the tax implications of building your plan. First, you need to understand where your income needs to be coming from for tax reasons. We want to make sure you have income during those earlier years of retirement, perhaps, from Roth IRAs, thus taking smaller amounts from Traditional IRAs. 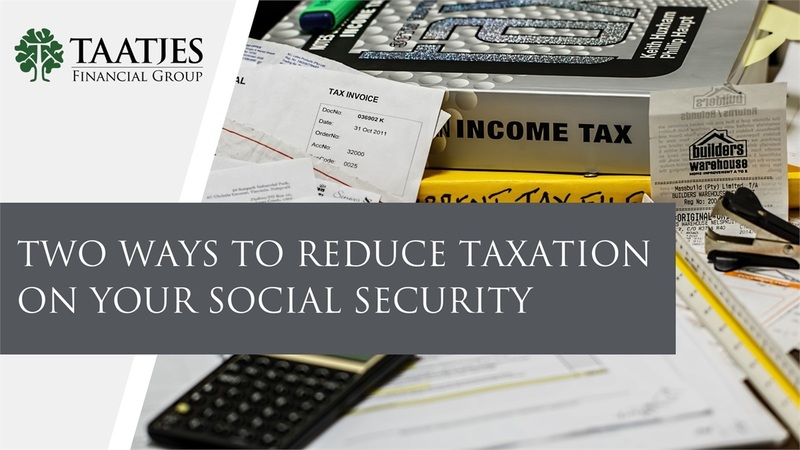 This will minimize the amount of social security and other taxable income needed to fund your retirement. One thing we often do with clients are "Roth conversions" where we take monies and convert it into Roth IRAs paying the tax up-front. So, we can later create more tax-free income in retirement. You don't pay taxes on a benefit you're not receiving. It may make sense for you to intentionally delay the start of your Social Security benefits. Tim Mattern has earned the National Social Security Advisor certificate from the National Social Security Association LLC in Cincinnati. The NSSA certificate promotes advanced Social Security education providing Mattern with the knowledge to counsel clients on the best way to claim Social Security benefits in order to optimize lifetime Social Security income. With this training, Tim can guide clients through the many Social Security options that are available. If you help planning your retirement income or have questions regarding the taxation of your Social Security, please, don't hesitate to reach out to us for your no-cost, no-obligation meeting.